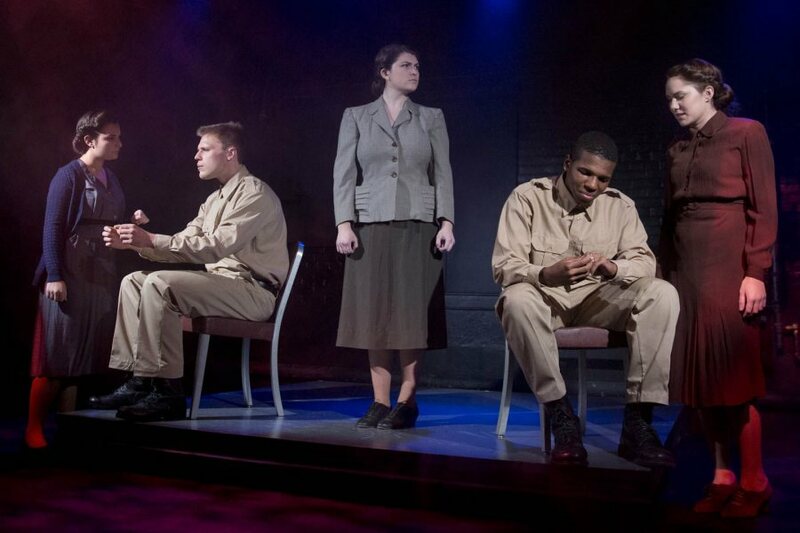 Director Sam Wheeler ’17 brings radio storytelling to life in his stage production of Norman Corwin’s World War II-era broadcast play They Fly Through the Air With the Greatest of Ease, . A cast of five performs the play three times this weekend in the Black Box Theater. 1. Corwin was one of the first playwrights to use entertainment as a medium for spotlighting serious social concerns. Wheeler, who is a theater and sociology major from Skowhegan, Maine, learned about Corwin from his parents, Timothy Wheeler and Maura Smith, who co-direct theatrical productions at Skowhegan Area High School. An influential writer and director, Corwin wrote They Fly Through the Air in 1939 for his weekly CBS radio program Norman Corwin’s Words Without Music. 2. The story takes place in a warplane that bombs civilians during the Spanish Civil War. 3. Rather than casting to specific roles, Wheeler created a five-member ensemble cast. Each will play several roles, allowing for more characters. For example, the original script gave most of the dialogue to the narrator. The cast comprises Nick Muccio ’16, of Concord, N.H.; Claire Sullivan ’19 of Montville, N.J.; Tricia Crimmins ’19 of Chicago; Becca Havian ’19 of Piedmont, Calif.; and Michael Driscal ’19 of Cleveland. 4. This project is part of an independent study requirement for the theater major at Bates. The project helps to prepare juniors to write a senior thesis, and Lecturer in Theater Corey Hinkle is Wheeler’s adviser on the project. “What is typically done during junior year is an independent study in directing. It’s got parameters of like a 25- to 40-minute show with a small cast, a very small set. It’s really just exploring stuff that you’re interested in,” Wheeler says. For Wheeler, “it’s exploring this one piece of literature … and seeing how it translates to a traditional play setting.” Where the original radio production sought to create images and action through the imaginations of its listeners, Wheeler’s challenge was using his imagination to put images and action on the Black Box Theater stage. 5. They Fly Through the Air runs only 30 minutes.